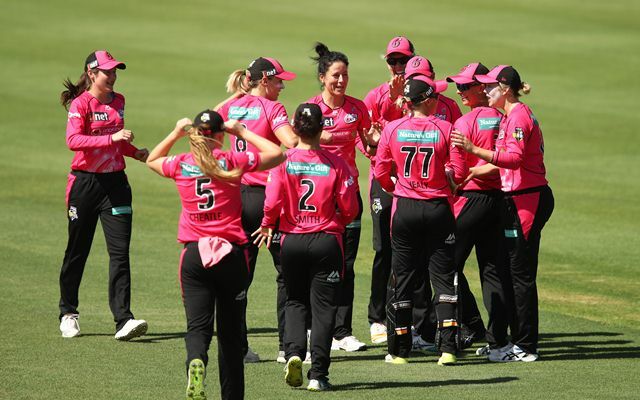 The Sydney Sixers are expected to make it to yet another WBBL final by knocking out the Melbourne Renegades. 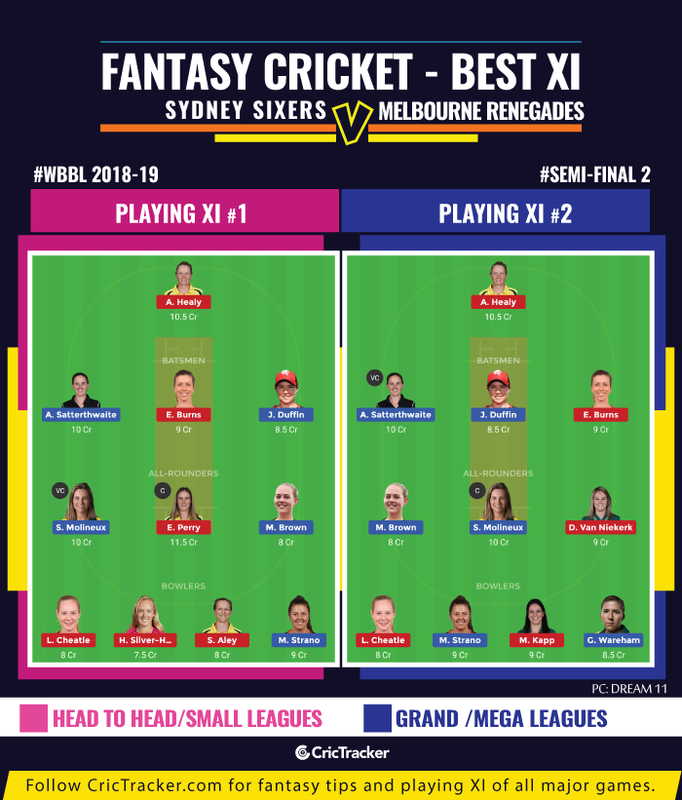 The second semi-final of the WBBL 2018-19 will be played between Sydney Sixers and Melbourne Renegades who are filled up with some quality all-rounders and International stars. The Sixers will be eyeing their 4th WBBL final in as many seasons that included titles in previous two editions. They will once again be banking on the form of Ellyse Perry who is having a record-breaking WBBL that made her the first player across BBL and WBBL to score 2000 runs. On the other hand, the Melbourne Renegades have Sophie Molineux who is in no way less than Perry to produce an impact in the game. Her form played a key role in guiding the Renegades to their first ever WBBL semi-final. The Amy Satterthwaite-led team has won five of their last seven matches after a below-par start. The defeat to Sixers in the last league match might have shrunk their confidence ahead of this do-or-die game. The 2nd semi-final match of the Women’s Big Bash League (WBBL) will be played between Sydney Sixers and Melbourne Renegades at the Drummoyne Oval in Sydney. The match starts at 1:50 PM local time (2:50 AM GMT) (8:20 AM IST). The Drummoyne Oval pitch to be used for the Sixers-Renegades game can be judged on the basis of how the first semi-final plays. The used tracks in the WBBL operate better under the lights producing higher scores in comparison with the afternoon fixtures. The Drummoyne Oval doesn’t have a great history in Women’s T20s but could well change on the semifinals day. Ellyse Perry (C), Sarah Aley, Erin Burns, Lauren Cheatle, Ashleigh Gardner, Alyssa Healy, Marizanne Kapp, Sara McGlashan, Hayley Silver-Holmes, Lauren Smith, Dane Van Niekerk. Amy Satterthwaite (C), Maitlan Brown, Jess Duffin, Claire Koski, Erica Kershaw, Sophie Molineux, Molly Strano, Lea Tahuhu, Georgia Wareham, Courtney Webb, Danielle Wyatt. Erin Burns has been a silent performer for the Sydney Sixers as she aggregated 237 from 13 innings at a strike rate of 134.65. Burns also bagged seven wickets in the 19 overs she has bowled in this tournament at an economy rate of 6.94. Ellyse Perry and Sophie Molineux have to be outright picks for multipliers due to their consistency. The likes of Alysa Healy and Amy Satterthwaite can be considered for the vice-captain’s role. One of the big names in the team is Danielle Wyatt who can be ignored. That is because the other players with 9 or more credits are expected to produce handy contributions with the ball.